"(young kid) Dude, what's it like being 40? 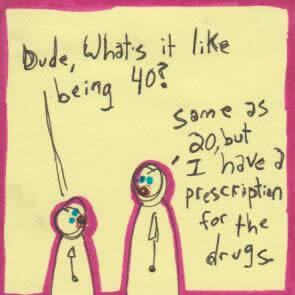 (older guy) Same as 20, but I have a prescription for the drugs." Purchase this hilarious sticky note art on smarmy t-shirts, original coffee mugs, buttons for your co-workers, and much, much more! .